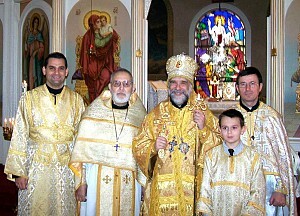 On the Sunday of the Publican and Pharisee (24 February) Bishop Michael made an archpastoral visit to Saint John the Baptist Orthodox Church in Alpha NJ. It was the third visit to the parish by His Grace as ruling hierarch of the diocese. Great Vespers was served on Saturday evening with Litiya (blessing of loaves, wheat, wine, and oil); after Vespers parishioners and their rector, Archpriest Bohdan Ostash, had a discussion with His Grace during a fellowship reception. On Sunday morning, the Divine Liturgy was celebrated followed by a home-cooked meal prepared by the parishioners as His Grace met with the faithful and answered their questions. Father Bohdan offered his gratitude to Bishop Michael, saying: “Thank-you, Vladyko, for your archpastoral guidance and inspiring words! May God grant you many years!"